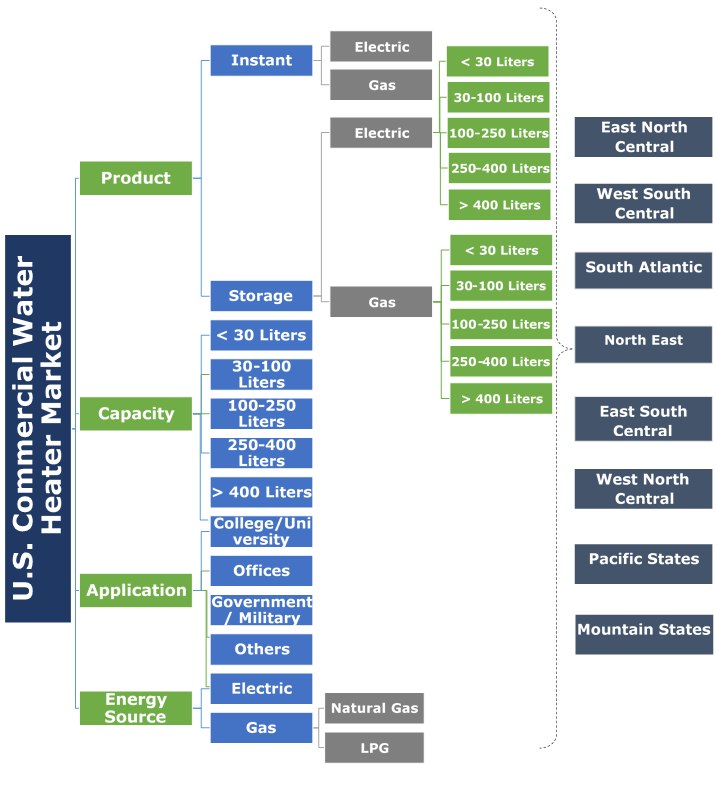 U.S. Commercial Water Heater Market size was valued over USD 540 million in 2018 and the annual installation is predicted to exceed 2 million units by 2025. Rapid development of high-rise buildings fueled by foreign and local investment will foster the U.S. commercial water heater market. Stringent policies toward deployment of energy efficient electrical systems along with significant reduction in heating bills will enhance the industry outlook. Increasing demand for space heating along with deployment of various central heating systems will encourage the product adoption. 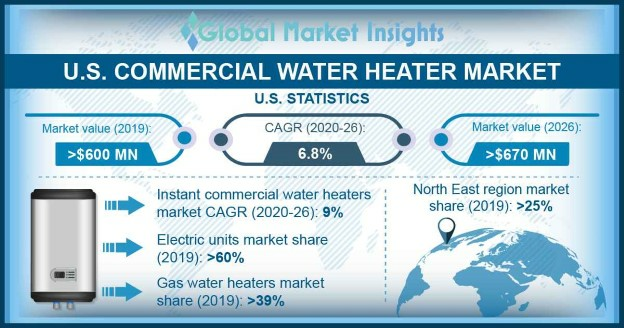 Increasing spending in R&D in order to introduce innovative product designs along with robust development of service sector will drive the U.S. commercial water heater market. Rapid awareness regarding the new technologies coupled with increasing demand for instant supply across hospitals, care centers and offices will augment the industry landscape. In 2017, A.O. Smith recorded a 9% increase in revenues from North America water heater segment. Rapid growth in government funded green building projects in order to comply with building efficiency codes and standards will stimulate the U.S. commercial water heater market growth. Development of smart cities along with provisions to deploy advanced heating technologies to minimize carbon emissions and heating bills will augment the industry landscape. For instance, in 2015, the U.S. Department of Energy (DOE) mandated the designers and manufacturers to avail new technologies for construction of heaters which were graded on the basis of standby loss and thermal efficiency. Easy repair and maintenance, low deployment cost and simple designs are the key factors facilitating the demand across U.S. storage water heater market. Varying range of capacities for a wide application purpose along with reliable supply of pressurized water will complement the industry landscape. Furthermore, expensive product designs along with additional labor cost associated with its counterparts will positively enhance the industry outlook. Wide adoption of instant heating systems on account of low energy consumption and compact designs will foster the U.S. water heater market. Increasing demand across offices and hotels owing instant hot water requirement will complement the business landscape. In addition, introduction of advanced models with leakage detection systems, multiple communication options and Wi-Fi connectivity will enhance the product penetration. Ongoing measures by the industry players to reduce their carbon footprint along with increasing investment toward product design and manufacturing will propel the 100-250 liters water heater market. Prevailing environment protection policies to limit greenhouse gas emissions from commercial establishments coupled with replacement of conventional heating systems will lead to installation of large number of units. Growing hot water demand across shopping complexes coupled with government directives toward the installation of ecofriendly heating systems across commercial facilities will thrust the demand of 250-400 liters capacity units. Need for effective control and management across public facilities including airports and shopping malls will stimulate the U.S. commercial water heater market growth. Simple designs coupled with the availability of wide electricity distribution network will fuel the electric water heater market growth. Easy access to electricity along with hassle free installation and maintenance have led to mass adoption of these products. The estimated energy factor for an electric heating system is 0.95 which is higher in comparison with fuel fired units. In addition, introduction of low power consuming tankless systems along with constant prices in contrast with volatile fuel cost will augment the business landscape. The U.S. gas water heater is anticipated to grow over 7% by 2025. Mass flow rate along with large heating output are the key factors that will stimulate the product demand. Increasing demand from off grid regions along with frequent power outages will result in massive deployments of gas fired units. Growing demand across hotels and offices owing to large hot water requirement will positively influence the industry outlook. Ongoing spending for construction of colleges and universities along with respective government directives for installation of water heaters will foster the U.S. commercial water heater market. Increasing consumption of hot water across educational institutes coupled with adoption of advanced systems in order to minimize energy bills will positively influence the industry landscape. Introduction of advanced digital technologies coupled with growing recognition of instant heating systems across offices will fuel the U.S. commercial water heater market. Over the past decade the region has witnessed extensive development of skyscraper buildings. Ongoing government mandates toward installation of individual heating systems will further lead to product penetration. Rapidly increasing tourism along with growing demand from hotels and resorts will fuel the U.S. commercial water heater market growth. Florida and Nevada are amongst the largest tourism centers across the U.S. The travel and tourism industry contributed over USD 1501.9 billion toward the GDP in 2017 and is expected to increase by 8.4% in 2028. Stringent environment policies in order to limit the carbon emissions along with paradigm shift toward cleaner fuels will drive the U.S. commercial water heater market. Abundant availability of low-priced gas along with established distribution network will enhance the industry landscape. The Texas commercial water heater market was valued over USD 30 million in 2018. Positive outlook toward the healthcare sector along with presence of prominent commercial centers will augment the industry landscape. Robust deployment of tankless heating systems across hospitals and care centers on account of product longevity and on demand heating will complement the business landscape. Eminent players operating across the U.S. commercial water heater market include Bosch Thermotechnology, Ferroli, A.O Smith, State Industries, Bradford White, Rinnai Corporation, Ariston Thermo, Rheem Manufacturing, Vaillant Group, Linuo Ritter, Haier Electronics, Hubbell, Saudi Ceramics, Whirlpool, Jaquar, Viessmann Group and Kanch Water Heaters. Increasing spending toward research & development and product differentiation are key strategic imperatives followed by the industry players. In addition, acquisitions and mergers along with partnerships with eminent technology providers will bring better growth prospects for the industry. The water heaters are utilized to meet the hot water necessities across the various commercial establishments including hotels, hospitals, government facilities, colleges & universities and others. They are primarily classified into two types that include instant and storage water heaters. The conventional storage heaters comprise an insulated tank and vent pipes, powered by either gas or electricity. The heaters are inbuilt with a T&P relief valve which open automatically if the pressure of the tank surpasses the critical limit thus, ensuring the safety. While the tankless heaters are generally installed for point of use application and consist of a system of coiled pipes connected to the cold-water supply from one end and hot water delivery pipes from the other end.